Three army commandos, including two Captains, and a militant were killed on Sunday in the fierce gunfight with a group of terrorists holed up inside a government building on the outskirts of Srinagar, raising the toll to seven in the encounter that began yesterday afternoon. Kumar was martyred when he entered the EDI institute at midnight. The multi-storied building of Entrepreneurship Development Institute (EDI) building in Pampore caught fire this afternoon as the encounter between army and the heavily-armed terrorists, suspected to be 3-4 in number, continued till late tonight on the second day. A fire broke out this afternoon at the Entrepreneurship Development Institute (EDI) building, from where nearly 100 people had been evacuated to safety following the stand-off. Earlier on Sunday, an army Captain of the elite 10 Para Regiment died after he was shot while entering the building on the Srinagar-Jammu national highway in which a group of heavily armed guerrillas are holed up. 10:00 pm The body of Capt Pawan Kumar was brought to his residence in jind on Monday. Hundreds of people from all communities gathered to pay tribute to the martyr. Capt pawan kumar (23) was the only son of his parents. His father is an Ex-serviceman who is now principal of a school. His mother is a teacher. He had done his schooling from DAV school in jind before joining NDA. His body is being taken for cremation to their native village Badana. 9:45 pm Terrorists have taken position in main building. It is a huge campus. We will take as long as it takes to clear the building, says Lt Gen Satish Dua. 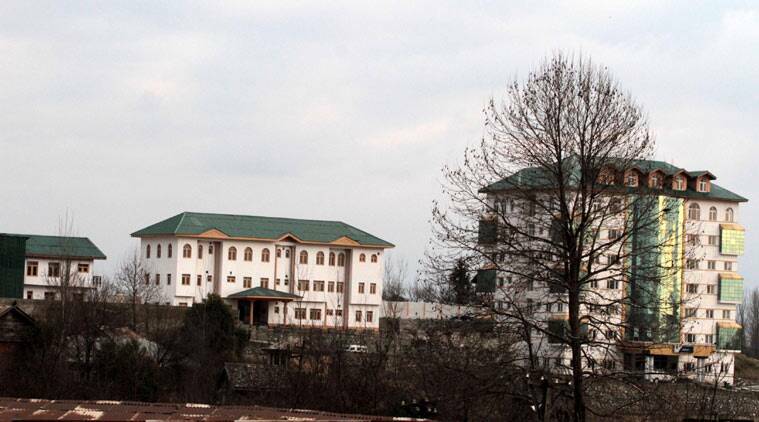 9:33 pm Security forces were put on high alert across Jammu region following the encounter in Pampore in Kashmir where heavily armed militants have been holed up in the building of Entrepreneurship Development Institute (EDI) on the Jammu-Srinagar National Highway. 8:00 pm One more soldier killed, toll rises to six: Army. 6:21 pm Army says operation in its last stage. Heavy firing in Pampore. 4:11 pm Mortal remains of Army Capt Pawan Kumar will be transported by air to Jind on Feb 22. Last rites to be performed at his village tomorrow. 3:41 pm: Army launches final assault as police enter EDI building. An Army paramilitary captain identified as Pawan Kumar was killed while leading from the front. Twenty-two-year-old Kumar was killed when the army stormed the EDI Complex at around midnight. The captain, who hails from Jind, Haryana, is from 10 Para Special Forces team has been part of two successful operations in which three terrorists were killed. Captain Pawan was born on 15 December 1993, a date which happens to be the Army Day. He was commissioned in the army on 14 December 2013 and has been serving with 10 Para Special Forces since. The EDI building where militants are holed up caught fire as army and police are trying to flush them out. His colleagues in the army remember Captain Pawan as “a very brave and intrepid officer, who though with barely three years of service had maturity beyond his years”. The Army and Special Operation Group of J-K Police are busy flushing out militants holed up in the EDI complex in Pampore. “In a tricky deliberate operation as militants hiding in a government building with the possibility of some more civilians trapped not ruled out,” he said, adding that the safety of civilians is paramount and troops are moving cautiously. Special teams of army and Special Operations Group of JK police are busy in room to room search of the five storey EDI complex. An officer told The Indian Express that three to five militants could be hiding in the complex. “It is very difficult operation and troops are taking extreme caution,” he said, adding that intermittent firing is still on. Sources said army and police officials tried to storm the complex at mid night but faced stiff resistance from the militants. The police has already closed the Srinagar Jammu national highway at Pampore and the traffic is allowed on adjoining routes. 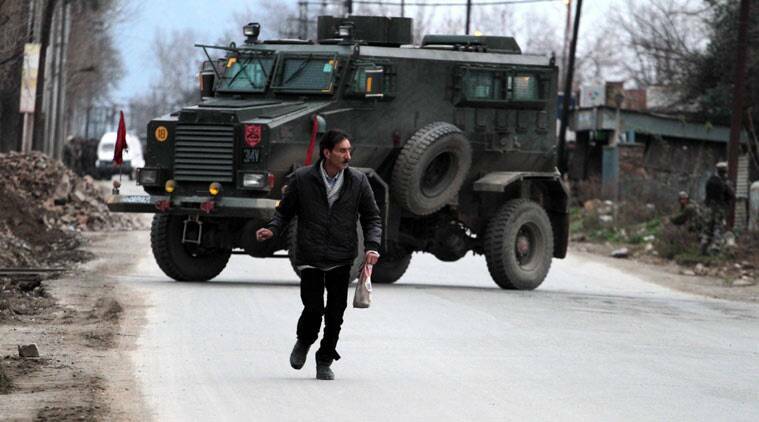 On Saturday evening militants attacked a CRPF convoy in which two jawans were killed and 13 suffered injuries. Later militants took refuge inside the EDI complex. More than 100 civilians majority of them employees of EDI qere evacuated from the complex and its adjacent complexes. A civilian Abdul Gani who was engaged as Gardner in the EDI was also killed in the cross firing. One of those who was present inside the complex claimed that they were asked by militants to leave because they did not mean any harm to civilians. 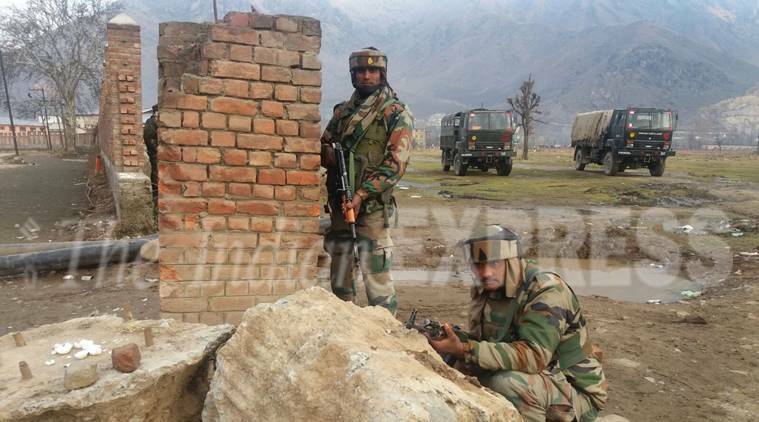 Personnel of the Army, whose elite 15 Corps headquarters is located barely 10 kms from the encounter site, were rushed to the encounter site to assist the local police and the CRPF. The employees and trainee students were also present when militants entered the EDI campus. Sources, however, said that majority of employees took shelter in the EDI hostel building that is away from the main office building. Some officials said that 60 employees were in the campus. EDI Director Mohammad Ismail Parray had said that he is in Jammu and gathering details about the incident.